Here are seven things you should know about the 2018 Ottawa municipal elections. Capital: Shawn Menard takes over from two-time councillor David Chernushenko after a tight four-way race. Menard, who snagged nearly 30 per cent of votes, is a civic activist and public school board trustee. Chernushenko placed third behind Menard and Christine McAllister. Stittsville: Business consultant Glen Gower takes the reins from Shad Qadri, in office since 2006. Gower took more than 55 per cent of the total vote. Gloucester-South Nepean: Former journalist Carol Anne Meehan signs on to a new role, winning the ward from Michael Qaqish. Seven women are at the council table, up from four last term. 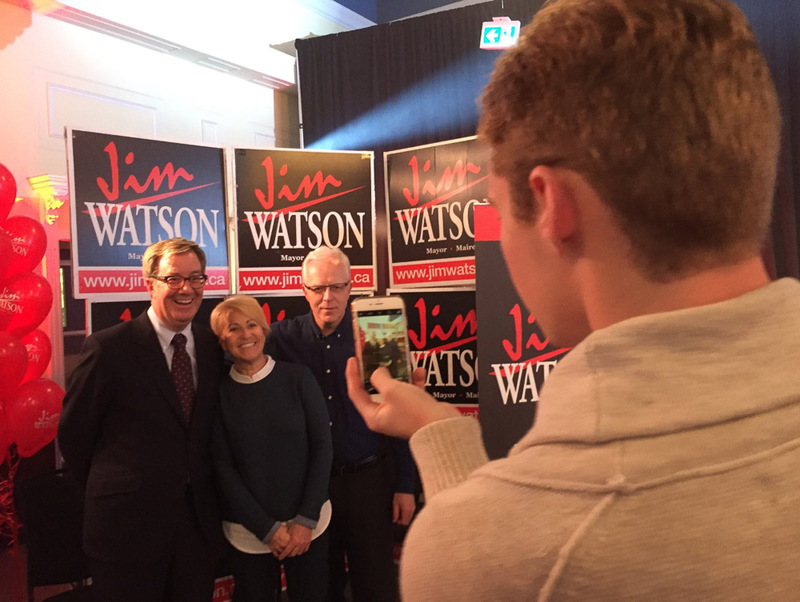 Jim Watson roars back into the mayor’s chair with more than 70 per cent of the vote. Watson teared up during his victory speech Monday night when speaking about his parents – before cracking his most popular joke from the campaign trail. Innes: Laura Dudas takes the seat she tried to win in 2014 when Jody Mitic was elected. Kanata North: Jenna Sudds, a business consultant, wins the west Ottawa seat with more than 45 per cent of the vote. Sudds replaces Marianne Wilkinson, who endorsed Sudds. Bay: Theresa Kavanagh, a former school board trustee who ran for the NDP at the federal level in the 1980s, replaces Mark Taylor, who stepped down. Orléans: Matthew Luloff, an Afghanistan war veteran, wins the seat left vacant by the retirement of Bob Monette. Luloff beat 16 rivals and won with less than a quarter of the vote. Here’s the unofficial voter turnout count, according to the Elections Ottawa results page. Voter turnout hit 56,861 at the advance polls. More voters cast ballots in 2018 compared to 2014, when turnout was only 39.92 per cent. Despite the increase, the 2018 numbers fell short of the high-stakes races of 2010, where 44 per cent of eligible electors voted. Ottawa voters might have noticed candidate ads on their way to the polls Monday. Same-day paid advertising is permitted in municipal elections but not at the provincial and federal levels. Find the full results of the 2018 Ottawa municipal elections here. What fantastic coverage, great job folks! Thank you, Mateo! We had an amazingly hardworking team.